Awesome atmosphere, nice pancakes for breakfast everyday, free bus shuttle to the night markets (lagoon etc.)... Staff is great and happy to help with any problems. Pool area is really nice. Rooms are clean as well as bathrooms, aircon is great. A lot of activities planned, game nights, pub crawl etc. Overall best hostel I stayed at so far. 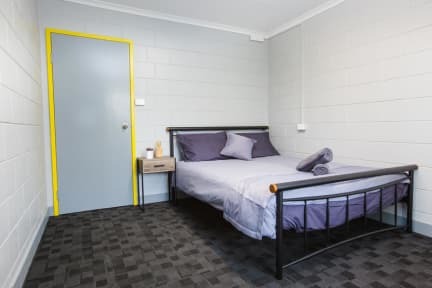 Big clean hostel with plenty of space for socialising. Dorm rooms were clean as were bathrooms and showers. There were only a few showers as some were under construction but this never caused us an issue as one was always free. The gym pass was brilliant and the gym down the road was great to use. Free breakfast was a bonus and the kitchen was big and well equipped meaning dinner time was easy. The only downside of this hostel was the amount of live in workers- there were more than guests! Apart from the loud music all day long and till quite late in the evening it is a great hostel! (definately need earplugs when you want to sleep early) Lots of activities, shuttle bus, friendly people and good airconditioning. Even two charge point per bed. No lockers in the rooms though and not a lot of space for your stuff. Free breakfast with pancakes, bread, oats, cereals, toppings and fruit and beans was surprising. Amazing hostel for this price! About 20min walk to the lagoon. Really clean hostel and the rooms were comfy and spacious. Location isn’t the best as it’s probably the furthest away from the main parts of Cairns compared to other hostels. Was a good hostel towards the end of my time in Cairns when I wanted a bit more peace and quiet. Only spent 1 night due to an early flight the next day; otherwise, I'm too old for the Cairns hostel scene. The dorm rooms were EXCELLENT - great aircon, memory foam mattress & pillows, charging port at the bed, & a sink in the room. The rest of the facilities left a little to be desired; the showers were hot but so was the entire bathroom. Parking is somewhat limited on site but is free on the street around the corner. There is a bar/social area that was lively but the noise died down by 11/12.